Located within Independence National Historical Park in Philadelphia, Pennsylvania, Independence Hall commemorates the location of the signing of the United States Declaration of Independence and Constitution and is open to the public as a living history museum for private guided tours. 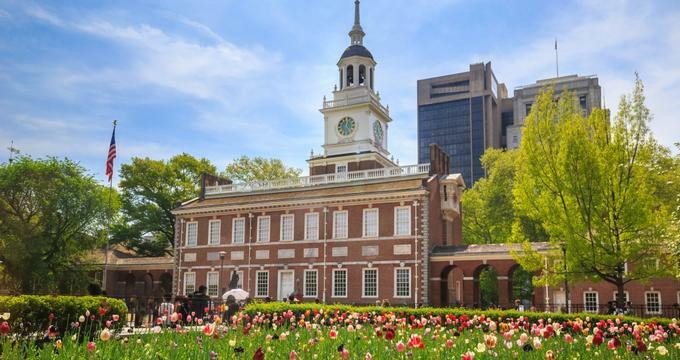 Plans for the construction of what is now known as Independence Hall date back to 1729, when initial public discussion commenced regarding the construction of a state house for the Philadelphia area. A committee was formed in 1730 to oversee the building’s fund raising and construction, consisting of notable early American public figures such as Andrew Hamilton and Thomas Lawrence. Tension within the committee over the location of the building led Hamilton to appeal to the House of Representatives, which eventually granted him full control of the project’s completion and chose a location for the building along the city’s Chestnut Street, located between Fifth and Sixth Streets. The building was designed by Hamilton and Edmund Woolley and was constructed in segments between 1732 and 1751 as funds became available for the project. Beginning in 1753, the building served as the meeting house for the Pennsylvania Colonial Assembly. It is best known as the meeting site for the Second Continental Congress, which gathered representatives from each of the 13 American colonies and approved and signed the Declaration of Independence on July 4, 1776, declaring the United States’ independence from Great Britain. During the summer of 1787, representatives from the states gathered at the hall for the United States Constitutional Convention, which revised the prior Articles of Confederation into a rewritten Constitution for the new country. A number of other historic events have used the Hall as a symbolic location throughout United States history, including the open viewing of the funerary procession for assassinated President Abraham Lincoln in 1865, the congregation of the 1915 League to Enforce Peace, overseen by President William Howard Taft, and a number of modern demonstrations conducted throughout the 20th century as part of the Civil Rights and LGBT rights movements. The building was fully restored in 1948 and preserved as part of Independence National Historical Park, which also houses other historic Philadelphia sites and landmarks associated with the Revolutionary War and Declaration of Independence, including the Liberty Bell, Independence Square, and Carpenter’s Hall, which served as the meeting site for the First Continental Congress. Today, Independence Hall is operated by the National Park Service as part of Independence National Historical Park and is open to the public as a living history museum. The hall was designated as a UNESCO World Heritage Site in 1979 and is a U.S. National Historic Landmark District Contributing Property. As a major cultural landmark in the United States, the likeness of Independence Hall is depicted on the back of the American $2 and $100 bills and the Kennedy bicentennial half dollar, and has served as the inspiration for a number of similar structures built within the United States, including special buildings constructed for the 1893 World's Columbian Exposition and the 1939 New York World’s Fair. The two-story red-brick hall is constructed in the Georgian style of architecture and features a bell tower and steeple at its center, reaching a maximum height of 168 feet. Though a custom clock was constructed for the building’s bell tower in 1753 by Thomas Stretch, the tower notably housed the famed Liberty Bell until the 1850s. Following the installation of the Centennial Bell in 1876, the Liberty Bell was showcased within the hall’s ground floor until it was moved to its current location at the Liberty Bell Center following the American bicentennial. The hall’s interior features an assembly room, Supreme Court room, Governor’s Council chamber, and Committee of Assembly chamber, all of which are furnished with period-appropriate furniture and accessories. More than 645,000 visitors tour the facility each year as part of private guided tours, offered daily throughout the year with the exception of some major national holidays. All tour tickets are free, though advance reservation tickets require a nominal handling fee. Timed entry tickets are required during peak season between March and December, available at the Ranger’s Desk within the Independence Visitor Center. Visitors are encouraged to arrive as early as possible to obtain same-day tickets, as daily reservations frequently sell out quickly. Tours begin every 15 minutes to half hour, depending on season and daily tour participation, and showcase all rooms within the first floor of the building, with limited touring of the second season available on select tours during the park’s off season. All tour participants must complete a security screening prior to touring any buildings within Independence Square. Tour participants are encouraged to bring minimal bags and personal items for convenience and security, and weapons, pocket knives, and pepper spray are prohibited within the building. Independence Hall’s first floor is fully handicap accessible, with photograph exhibits available for exhibits located on the building’s second floor, and ASL and pamphlet accommodations may be provided for visitors with hearing impairments with special advance arrangements.